SmitCo Review by Bridget Axtell | Scented Emoji Nail Polish - The Perfect Gift for Any Girl! Girls of all ages love nail polish. And what is even better than pretty nail polish? Scented nail polish! SmitCo offers a wide variety of affordably priced gifts for girls; including jewelry, diaries, temporary tattoos sets and scented nail polish sets! Emojis are very popular right now, so it seemed like the perfect gift choice this holiday season! 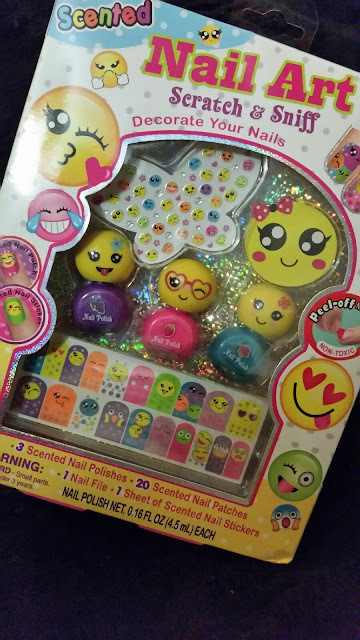 What girl wouldn't love scented nail polish and scented emoji nail stickers!? The scented nail polishes are bright and come in a girl's three favorite colors. They also smell delicious... almost good enough to eat! The scented nail stickers are simply adorable! They are cute, funky and fun! Too cute and most definitely a conversation starter among young girls! 3 Scented nail polishes - hot pink, turquoise and purple - a girl's favorite colors! All the products have been tested and are safe for use by kids of all ages. The nail polish is also water based and can just be peeled off with no need for acetone to remove it! 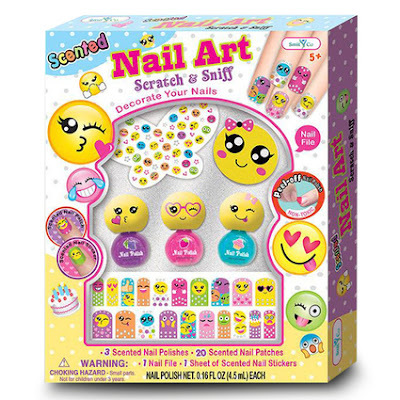 Do you know a girl who would fall in love with this scented nail art set?